The new week has started ..
La nueva semana ha comenzado ..
Una buena semana para usted ..
Te sigo de vuelta! Besos :). Beautiful outfit! Love the white pants and polka dots together! You look so pretty! Hope you are having a wonderful day! El top es muy bonito, y con esos pantalones va genial! Lovely outfit, the white pants and polka dots are just perfect together. How cute you are, I love the top. 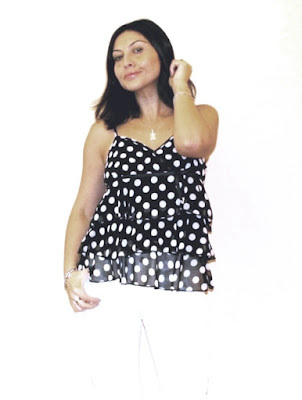 What a great outfit, I love the polka dot top and the white jeans! Sweet tiered polka dot top!!! gorgeous outfit, polka dots is so sweet and classic!!! Amazing top, so chic and femine. You look stunning. You look stunning doll and loving the polka dot on you.